Diverse and dynamic, Cuba's turbulent past shines from its people, culture and architecture. The largest island in the Caribbean Sea is a labyrinth of colonial relics, jagged mountains and pearl-white beaches surrounded by colourful coral reefs. Most famous for rum, salsa, cigars, rumba dancing, and its revolutionary past; Cuba also has nine UNESCO World Heritage sites. Imagine old Cadillac's zipping by pink, green and yellow buildings, while African rhythms and Caribbean aromas flood the atmosphere. With a typical Caribbean climate and an average sea temperature of about 28ºC, Cuba is the ideal beach holiday destination. 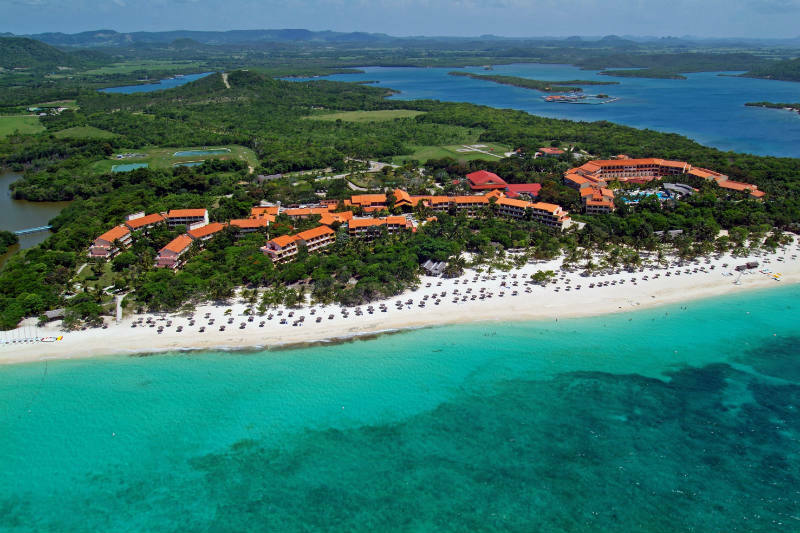 Dotted along the coast are Varadero, Guardalavaca and Cayo Coco. 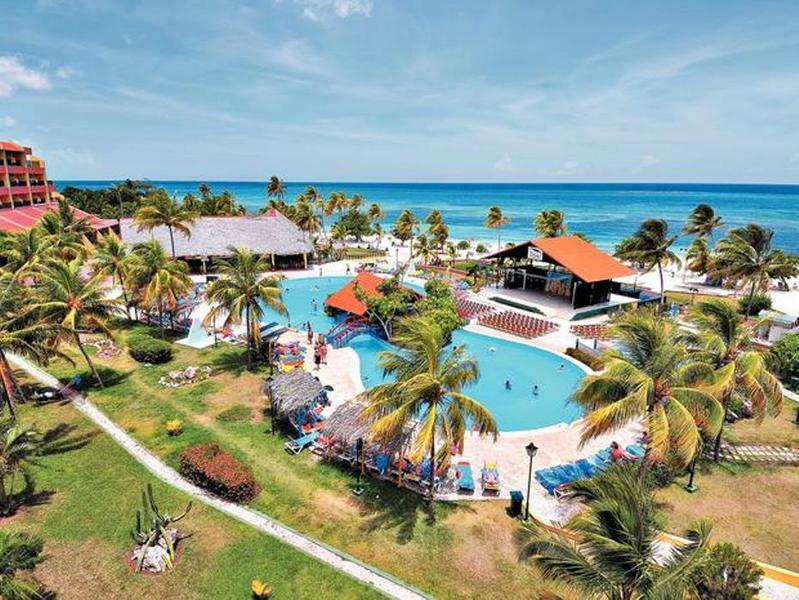 Stay in one of their luxury resorts and enjoy rum bars, snorkelling sessions, dolphin trips, jungle adventures, and nature trails featuring turtles, crocodiles and flamingos. Capital city Havana is home to Catedral de San Cristobal and Ernest Hemingway's favourite restaurant Bodeguita del Medio. Experience the legendary Cabaret Tropicana - once staging performances by Nat King Cole - for spectacular music, dances and costumes with African and Spanish flair. Original frescoes and Baroque buildings weave through Trinidad, and the resting place of Che Guevara is found in Santa Clara. Whether you want to plunge into the past or experience luxury in paradise, Cuba holidays are unforgettable. Similar to its island neighbours, Cuba is renowned for its tropical climate. With average temperatures of about 31ºC in summer and 25ºC in winter, Cuba is bathed in sunshine for most of the year. Dry season in Cuba runs from November to April. This is the best time to visit if you want less rain and humidity. December, January and February are sunny, but slightly cooler than the summer. Go in March or early April and you should find plenty of sunshine and increasing temperatures. From May to October, Cuba enjoys its wet season. Rain showers are more likely during this period, but they rarely last long and are sandwiched between hours of sunshine and blue sky. July and August are very popular tourist months where you'll find the hottest day and night temperatures of the year. Similar to the rest of the Caribbean, hurricanes are possible in Cuba with September and October considered the riskiest months. Aside from climate, the best months to visit for lively Cuban festivals are July and August. New Year's Eve is also enthusiastically celebrated in Cuba, while the Latin American International Film Festival in Havana lands in November. Cuba's long coastline offers lots of opportunities for water sports including jet-skiing, scuba-diving and snorkelling. Coastal resorts are great for boat trips, beach volleyball and swimming with dolphins, or you can take a jungle tour and visit wildlife at a nature reserve. Cuba's white sand is perfect for sunbathing, while plenty of relaxing bars and cafes are scattered around to take some shade. The main cities offer museums, cobbled plazas and historic churches to explore. Certain times of the year bring vibrant parades and festivals that are worth experiencing, or you can join in rumba dancing and see colourful cabaret acts. Cuba's miles of forests, mountains, tobacco plantations, sugar cane fields, and nine UNESCO World Heritage sites make it ideal for taking unforgettable excursions, too. Cuban cuisine is a mix of Spanish and Afro-Caribbean. Favourite ingredients include rice, beans, chicken, pork, and viandas - a Cuban term meaning root vegetables. Portions are large and food is very fresh - especially fish, shrimp and lobster. In Cuban restaurants, you find popular dishes such as: ropa vieja (shredded beef stew with tomatoes, peppers, onions, and garlic), lechón asado (roasted pork marinated in herbs, garlic and onions), fried plantain (banana), and boniato (sweet potato). Cuban specialities don't feature as many spices as Mexican or Jamaican menus, but many meat and seafood dishes are cooked in garlic sauce with onions and mild chilli. Cuba also produces delicious desserts thanks to its acres of sugar cane fields. Tasty and cheap street food is readily available - including pizza, tamales and corn fritters. Rum is Cuba's national drink and you can find it at low prices in bars, hotels and supermarkets across the country. Cocktails are also popular refreshments. Cuba libres (cola, lime and dark/light rum), mojitos (rum, lime, soda water, and crushed mint) and daiquiris (rum, lime, sugar, and maraschino) are on offer almost everywhere. You can enjoy lagers and a range of other spirits, or sip guarapos (sugar cane juice) and Cafe Cubanos (type of espresso), too. 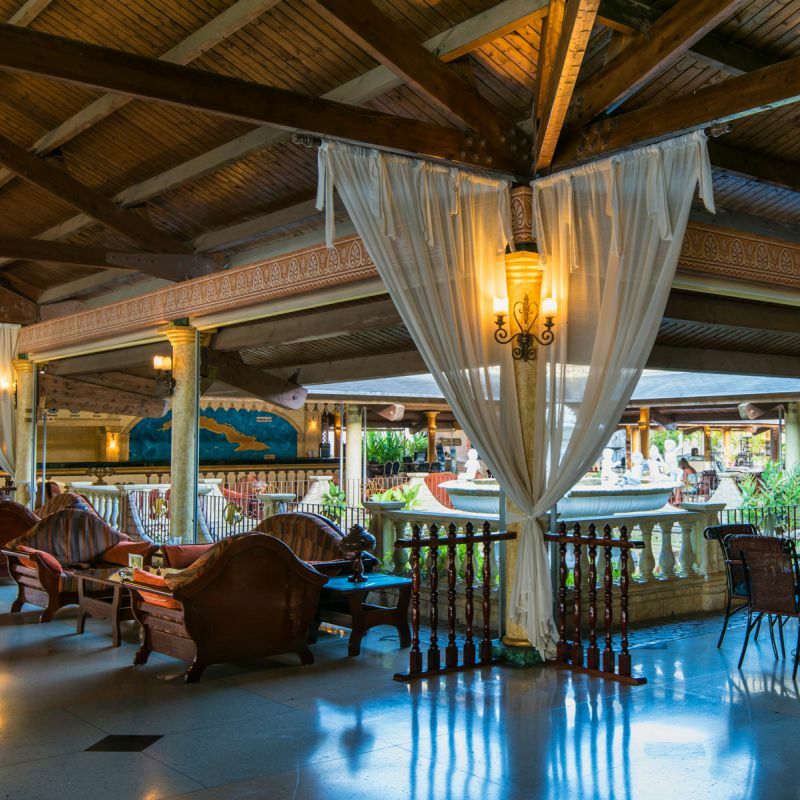 Stay in an all-inclusive hotel and you'll most likely find that mealtimes feature buffets with plenty of home favourites, local dishes, international specialities, and soft and alcoholic drinks. No matter where you go, Cuban nightlife is entertaining and memorable. Havana and other major cities offer plenty of rum bars and salsa clubs with live bands. There's also a great number of night-time venues featuring live entertainment that you can visit. Coastal resorts might be more quiet than the inner cities, but they still offer a vivid mix of places to go after sunset. There's a stream of seaside restaurants, as well as bars to suit any mood or taste. 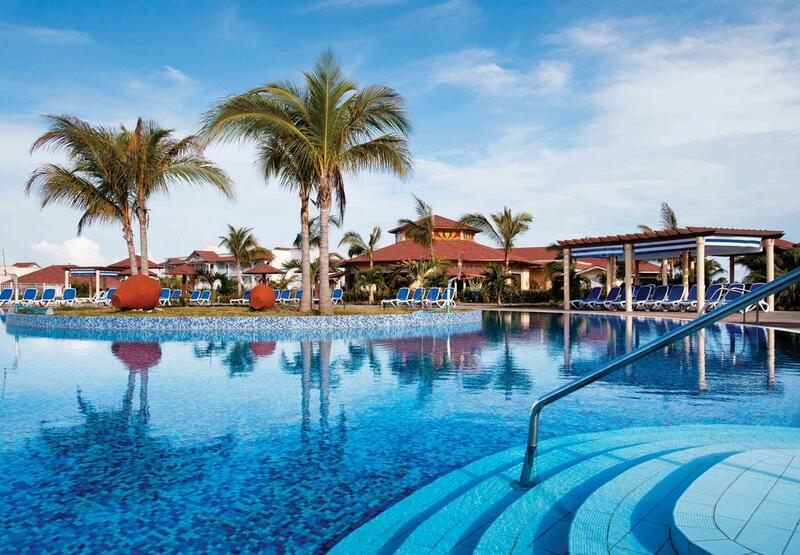 Most all-inclusive hotels will host their own entertainment if you prefer to stay on-site, too.